John Varvatos grants you a non-exclusive, non-transferable, limited right to access, use and display the Web Site and the materials thereon for your personal use only, provided that you comply fully with these Terms and Conditions of Use. You shall not interfere or attempt to interfere with the operation of the Web Site in any way through any means or device including, but not limited to, spamming, hacking, uploading computer viruses or time bombs, or the means expressly prohibited by any provision of these terms and conditions of use. John Varvatos reserves the right, at its sole discretion, to change, modify, add or remove any portion of these Terms and Conditions of Use, in whole or in part, at any time. Changes in these Terms and Conditions of Use will be effective when posted. You agree to review these Terms and Conditions of Use periodically in order to be aware of any changes. Your continued use of the Web Site after any changes to these Terms and Conditions of Use are posted will be considered acceptance of those changes. John Varvatos owns, controls, licenses or has the right to use and provide the Web Site and all material on the Web Site, including without limitation text, images, articles, photographs, illustrations, audio and video clips, (collectively the "Content"). The Web Site is protected by copyright as a collective work and/or compilation, pursuant to U.S. copyright laws, international conventions, and other copyright laws. John Varvatos is the owner of the copyright in the entire Web Site. John Varvatos owns a copyright in the selection, coordination, arrangement and enhancement of the Web Site. You agree to abide by any and all copyright notices, information or restrictions displayed on the Web Site. You may not modify, create derivative works from, participate in the transfer or sale of, post on the World Wide Web, or in any way exploit the Web Site or any portion thereof for any public or commercial use without the express written permission of John Varvatos. 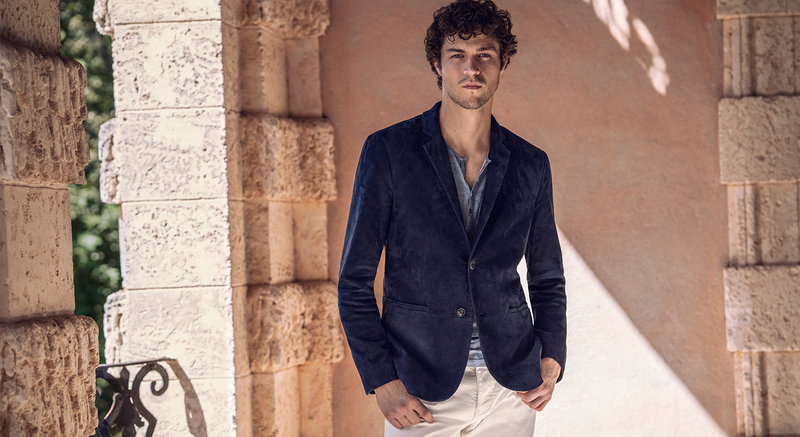 You may download a copy of Content from the Web Site for your personal use, provided that you maintain all copyright, attribution and other notices contained in such Content, including without limitation trademarks and service marks of John Varvatos and its affiliates or the copyright holder identified in the individual Content's copyright notice. You acknowledge that you do not acquire any ownership rights by downloading copyrighted material. You are responsible for complying with all applicable laws, rules and regulations regarding your use of any such downloaded Content. In the event of any permitted copying, redistribution or publication of material from the Web Site, no changes in or deletion of author attribution, trademark, legend or copyright notice shall be made. You may obtain more information on the copyrights, trademarks, and service marks of John Varvatos and its affiliates and Content owners by viewing John Varvatos' Copyright and Trademark Notices. John Varvatos shall have the right for any reason, in its sole discretion, to terminate, change, suspend or discontinue any aspect of the Web Site, including but not limited to Content, features, or hours of availability. John Varvatos may also impose limits on certain features and services or restrict your access to parts, or the entire Web Site without notice or liability. You agree that John Varvatos has the right, but not the obligation, to monitor all material on the Web Site at any time for any reason in its sole discretion to determine compliance with these Terms and Conditions of Use and any other operating rules that John Varvatos may establish from time to time. Notwithstanding this right of John Varvatos, John Varvatos does not and cannot review all materials posted to the Web Site by users, and John Varvatos is not responsible for any such materials posted by users. By using the Web Site, you agree not to post or transmit any unlawful, threatening, defamatory, libelous, obscene, pornographic or profane material or any material that could constitute or encourage conduct that would be considered a criminal offense or give rise to civil law or in equity. In addition to any remedies that we may have a law or in equity, John Varvatos reserves the right at all times to edit, disclose, refuse to post, request removal of, remove, or take any action we reasonably deem necessary to cure or prevent such violation or as may be necessary to comply with any law, regulation or government or agency request or if, in John Varvatos' sole discretion, such materials are objectionable or in violation of these Terms and Conditions of Use. You shall indemnify, defend and hold harmless John Varvatos, its parent, affiliates, subsidiaries and their respective officers, directors, agents, employees, content providers, licensors and licensees (collectively the "Indemnified Parties") from and against any and all losses, damages, liabilities, and claims and all fees, costs, expenses, of any kind related thereto (including, without limitation, reasonable attorneys' fees) incurred by the Indemnified Parties in connection with any matter, claim or lawsuit arising out of, based upon, or resulting from your use of the Web Site. John Varvatos reserves the right, at its own expense, to assume the exclusive defense and control of any such matter, claim or lawsuit otherwise subject to indemnification by you and you shall not in any event settle the same without the written consent of John Varvatos. The Web Site contains links and pointers to the other related World Wide Web Internet sites, resources, and sponsors of the Web Site. 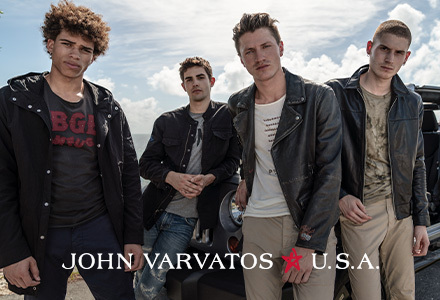 John Varvatos disclaims all responsibility or liability in connection with materials of third parties accessible through johnvarvatos.com. Links to and from any site to other third party sites, maintained by third parties, do not constitute an endorsement by John Varvatos or any of its subsidiaries and affiliates of any third party resources or their contents. 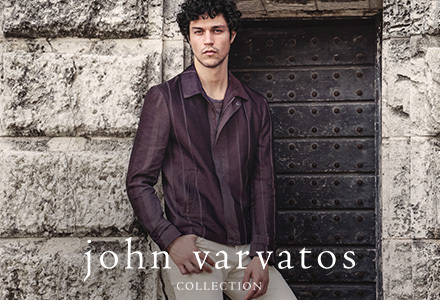 Links do not imply that John Varvatos or the Web Site sponsors are affiliated or associated with or are legally authorized to use any trademark, trade name, logo or copyright symbol displayed in or accessible through the links, or that any linked sites are authorized to use any trademark, trade name, logo or copyright symbol of John Varvatos or any of its affiliates. You should direct any concerns regarding any external link to the John Varvatos Web Site Administrator. John Varvatos does not represent or endorse the accuracy or reliability of any advice, opinion, statement, or other information displayed or distributed through the Web Site. You acknowledge that any reliance upon any such opinion, advice, statement, memorandum, or information shall be at your sole risk. John Varvatos reserves the right, in its sole discretion, to correct any errors or omissions in any portion of the Web Site. THE WEB SITE, INCLUDING ALL CONTENT, SOFTWARE, FUNCTIONS, MATERIALS AND INFORMATION MADE AVAILABLE ON OR ACCESSED THROUGH THE WEB SITE, IS PROVIDED ON AN "AS IS" "AS AVAILABLE" BASIS WITHOUT REPRESENTATIONS OR WARRANTIES OF ANY KIND WHATSOEVER EXPRESS OR IMPLIED, INCLUDING WITHOUT LIMITATION, NON-INFRINGEMENT, MERCHANTABILITY OR FITNESS FOR A PARTICULAR PURPOSE. NEITHER JOHN VARVATOS NOR ITS CONTENT PROVIDERS WARRANT THAT THE FUNCTIONS, FEATURES OR CONTENT CONTAINED IN THE WEB SITE WILL BE UNINTERRUPTED OR ERROR FREE, THAT DEFECTS WILL BE CORRECTED, OR THAT ANY OTHER SITE OR THE SERVER THAT MAKES IT AVAILABLE IS FREE OF VIRUSES OR OTHER HARMFUL COMPONENTS; NOR DO THEY MAKE ANY WARRANTY OR REPRESENTATION AS TO THE ACCURACY OR RELIABILITY OF THE WEB SITE, THE CONTENT THEREOF, THE MATERIALS, INFORMATION AND FUNCTIONS MADE ACCESSIBLE BY THE SOFTWARE USED ON OR ACCESSED THROUGH THE WEB SITE, ANY PRODUCTS OR SERVICES OR HYPERTEXT LINKS TO THIRD PARTIES OR FOR ANY BREACH OF SECURITY ASSOCIATED WITH THE TRANSMISSION OF SENSITIVE INFORMATION THROUGH THE WEB SITE OR ANY LINKED SITE. JOHN VARVATOS, ITS PARENT, SUBSIDIARIES, AFFILIATES, AGENTS OR CONTENT PROVIDERS MAKE NO WARRANTIES AND SHALL NOT BE LIABLE FOR THE USE OF THE WEB SITE, INCLUDING WITHOUT LIMITATION, THE CONTENT AND ANY ERRORS CONTAINED THEREIN UNDER ANY DIRECT OR INDIRECT CIRCUMSTANCES, INCLUDING BUT NOT LIMITED TO JOHN VARVATOS', ITS PARENT'S, SUBSIDIARIES', AFFILIATES', AGENTS' OR CONTENT PROVIDER'S NEGLIGENCE. IF YOU ARE DISSATISFIED WITH THE WEB SITE OR ANY MATERIALS ON THE WEB SITE, YOUR SOLE REMEDY IS TO DISCONTINUE USING THE WEB SITE. CERTAIN CONTENT MAY BE CONSIDERED OBJECTIONABLE BY INDIVIDUAL USERS AND USERS MUST EXERCISE THEIR DISCRETION IN USING AND ALLOWING MINORS OR OTHERS TO USE THE WEB SITE. UNDER NO CIRCUMSTANCES SHALL JOHN VARVATOS, ITS PARENT, SUBSIDIARIES, AFFILIATES, AGENTS OR CONTENT PROVIDERS BE LIABLE FOR ANY SPECIAL, INCIDENTAL OR CONSEQUENTIAL DAMAGES THAT ARE DIRECTLY OR INDIRECTLY RELATED TO THE USE OF, OR THE INABILITY TO USE, THE CONTENT, MATERIALS AND FUNCTIONS IN THE WEB SITE, INCLUDING WITHOUT LIMITATION LOSS OF REVENUE OR ANTICIPATED PROFITS OR LOST BUSINESS, EVEN IF SUCH ENTITIES OR AN AUTHORIZED REPRESENTATIVE THEREOF HAVE BEEN ADVISED OF THE POSSIBILITY OF SUCH DAMAGES. SOME STATES DO NOT ALLOW THE EXCLUSION OR LIMITATION OF INCIDENTAL OR CONSEQUENTIAL DAMAGES, SO THE ABOVE LIMITATION OR EXCLUSION MAY NOT APPLY TO YOU. IN NO EVENT SHALL THE TOTAL LIABILITY OF JOHN VARVATOS, ITS PARENT, SUBSIDIARIES, AFFILIATES, AGENTS OR CONTENT PROVIDERS TO YOU FOR ALL DAMAGES, LOSSES, AND CAUSES OF ACTION (WHETHER IN CONTRACT OR TORT, INCLUDING, BUT NOT LIMITED TO, NEGLIGENCE OR OTHERWISE) ARISING FROM THESE TERMS AND CONDITIONS OF USE OR YOUR USE OF THE WEB SITE EXCEED, IN THE AGGREGATE, $100.00. John Varvatos welcomes your comments regarding our services, including the Web Site. However, any or all material and information provided by you to the Web Site may be included in a database owned by John Varvatos, its parent, subsidiaries, and/or affiliates in which John Varvatos has rights and interest, including but not limited to the compilation copyright. We reserve the right to use any information or materials you provide to us or that we obtain through your use of the Web Site to the fullest extent permitted by law. By posting messages, uploading files, inputting data or engaging in any other form of communication (individually or collectively "Communications") to or within the Web Site, you grant to John Varvatos a perpetual, worldwide, irrevocable, unrestricted, non-exclusive, royalty-free license to use (including use for promotional and advertising purposes), copy, license, sublicense, adapt, distribute, display, publicly perform, reproduce, transmit, modify, edit and otherwise exploit such Communications and any ideas or materials contained in such Communications, in all media now known or hereafter developed and warrant that such information is not owned by a third party and that you have all rights necessary to grant such license to John Varvatos . This grant shall include the right to exploit any and all proprietary rights in such Communications including, without limitation, any and all rights under copyright, trademark, service mark or patent laws under any relevant jurisdiction. You waive all rights you may have to inspect and/or approve of any use by John Varvatos of any material or idea submitted by you in any Communications or receive any compensation for such use. 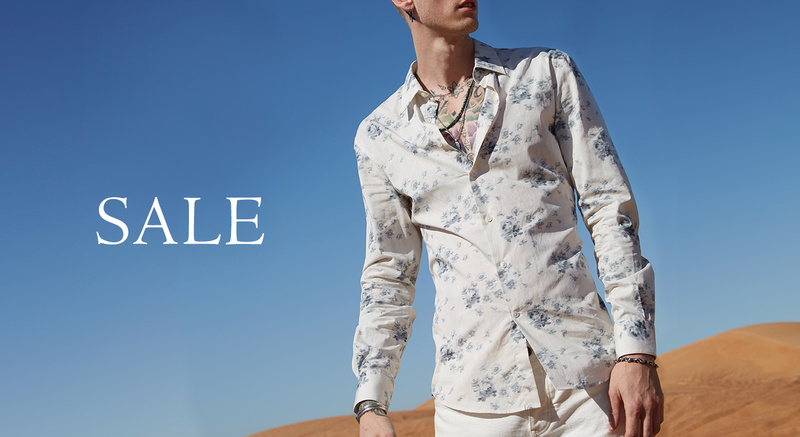 You waive all rights to any claim against John Varvatos for any alleged or actual infringements of any proprietary rights, rights of privacy and publicity, moral rights, and rights of attribution in connection with such Communications. You agree and understand that John Varvatos is under no obligation to use any material or ideas submitted by you in any Communications in any way whatsoever. You acknowledge that transmissions to and from this Web Site are not confidential and your Communications may be read or intercepted by others. You acknowledge that by submitting Communications to John Varvatos or the Web Site, no confidential, fiduciary, contractually implied or other relationship is created between you and John Varvatos, its parent, affiliates, subsidiaries, or agents other than pursuant to these Terms and Conditions of Use. John Varvatos shall not be responsible for the payment of any monies to any party in connection with John Varvatos' use of Communications submitted by you to the Web Site. 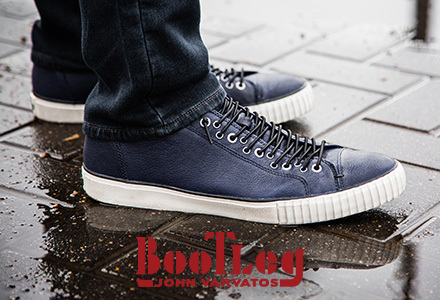 John Varvatos makes no representation that any materials in the Web Site, including any copyrights, trademarks, patents, and licensing arrangements, are appropriate or available for use in locations other than the United States. Those who choose to access this Web Site from other locations outside of the U.S. do so at their own initiative and are responsible for compliance with local laws, if and to the extent local laws are applicable. These terms and conditions of use constitute the entire agreement between you and John Varvatos with respect to the subject matter hereof, and supersede all previous written or oral agreements between the parties with respect to such subject matter. No waiver by either you or John Varvatos of any breach or default hereunder shall be deemed to be a waiver of any preceding or subsequent breach or default. The section headings used herein are for convenience only and shall not be given any legal import. These Terms and Conditions supersede any other agreement between you and us to the extent necessary to resolve any inconsistency or ambiguity between them. These Terms and Conditions of Use shall be governed by and construed in accordance with, and the Web Site shall be protected pursuant to the laws of the State of New York, without giving effect to any principles of conflicts of laws. The sole and exclusive jurisdiction for any action or proceeding arising out of or related to these Terms and Conditions of Use shall be an appropriate State or Federal court located in New York County in the State of New York and you hereby irrevocably consent to the jurisdiction of such courts. A printed version of the Terms and Conditions of Use shall be admissible in judicial and administrative proceedings based upon or relating to these Terms and Conditions of use to the same extent and subject to the same conditions as other business documents and records originally generated and maintained in printed form. If for any reason a court of competent jurisdiction finds any provision of these terms and conditions of use, or portion thereof, to be unenforceable, that provision shall be enforced to the maximum extent permissible so as to effect the intent of these terms and conditions of use, and the remainder of these terms and conditions of use shall continue in full force and effect. 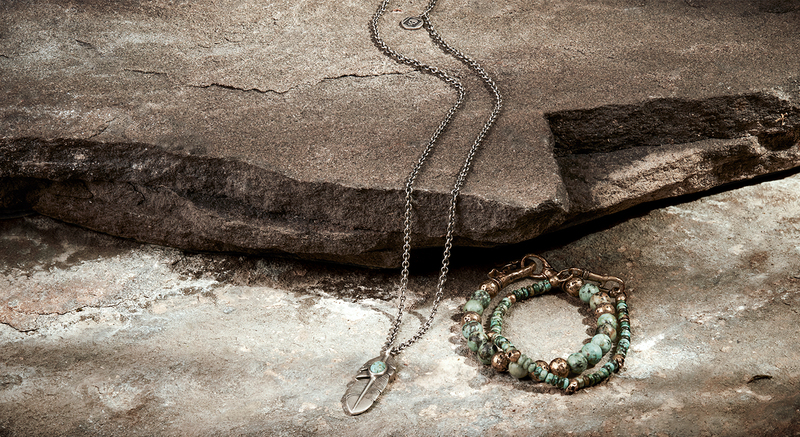 © 2009 John Varvatos, Enterprises, Inc. All rights reserved. JOHN VARVATOS is a registered trademark of John Varvatos Apparel Corp.